Organic Bug Bite Itch Relief with Colloidal Oatmeal. Made in New Hampshire. 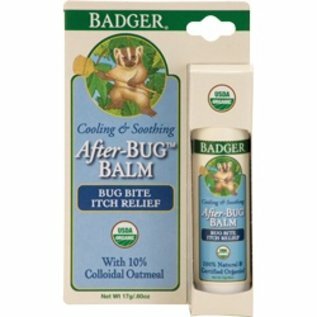 Certified organic and 100% natural bug bite itch relief balm. 10% organic Colloidal Oatmeal soothes and relieves itchy or irritated skin. Convenient travel size twist-up stick—take it with you wherever you go! Organic Beeswax, vitamin E-rich Sunflower oil, and essential oils of Seabuckthorn, Tamanu, and Lavender nourish and soften skin. Great for use by the whole family. Ahhh…soothing itch relief. Sometimes no matter how well we protect ourselves, an annoying mosquito still makes a meal of us. Then the itching begins, which leads to scratching, which provides temporary relief so you scratch some more, but the more irritated your skin gets, the more it itches. Put an end to the itch-scratch cycle with our certified organic and all natural After-Bug Balm. This gentle balm with soothing Colloidal Oatmeal and cooling Menthol relieves itchy bug bites and minor skin irritations. Organic Beeswax, vitamin E-rich Sunflower oil, and essential oils of Seabuckthorn, Tamanu, and Lavender nourish and soften skin. Convenient travel size means you can take it with you wherever you go! Pediatrician approved and tested hypoallergenic so it’s safe for sensitive skin and great for use by the whole family. Active Ingredient is 10% organic colloidal oatmeal. What is colloidal oatmeal and how does it work? The skin benefits of oats (Avena sativa) dates back to 2000 B.C. and the Ancient Egyptians who were among the first to recognize its skin-soothing properties. Colloidal Oatmeal refers to very finely ground organic oats suspended in liquid (such as a balm) and evenly dispersed. In this suspended state, the nutrient-rich oats are easily applied and absorbed, providing many protective benefits including temporary relief from itching and irritation. Approved by the FDA in 2003 as a natural skin protectant, Colloidal Oatmeal actives work by creating a barrier (or second skin) over inflamed and irritated skin, effectively sealing in skin’s natural moisture while easing discomfort to provide much-needed relief. Created by Badger Balm in Gilsum, New Hampshire. "Badger is a small, family-owned, family-run, and family-friendly company nestled in the woods of Gilsum, New Hampshire. We blend the finest organic plant extracts, exotic oils, beeswax, and minerals to make the safest, most effective products possible to soothe, heal, protect and otherwise treat your body. We work hard, have fun, and incorporate honesty, respect, and integrity into everything we do."